Join us for a morning of brunch and crafts with Annie from the Barn Owl Art Studio on April 7th from 11am-3pm! Enjoy a delicious brunch buffet provided by Ard’s Farm and sip on some mimosas as Annie helps you create some personalized signs for your wedding reception, a wedding gift or a sign for your new home! 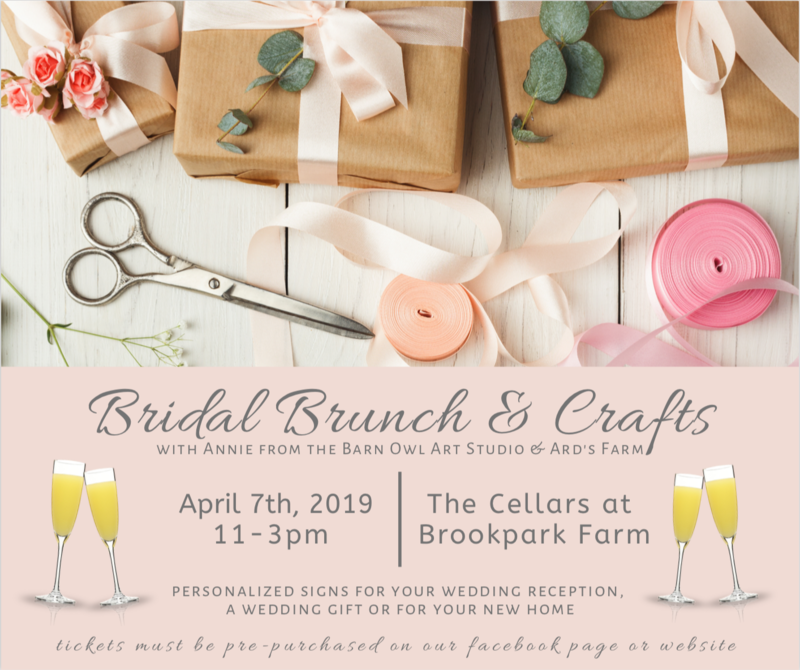 So grab your bridesmaids, friends or family and get crafty with us over brunch and mimosas at The Cellars at Brookpark Farm! Brunch will include an assortment of quiche, bagels, fruit and more, plus a complimentary mimosa bar! Your craft options include a 14×14 Unframed Panel, a 14×14 Framed Panel, a 14×14 Rustic Panel, or an 8×10 Initial Sign. Check out the discussion board on our Facebook page for project ideas! Tickets include your chosen craft, brunch and the mimosa bar (limit two mimosas per guest**). For this event you must pre-register and choose your projects in advance.